Pasta and cheese are easily at the top of the list of my favorite foods. 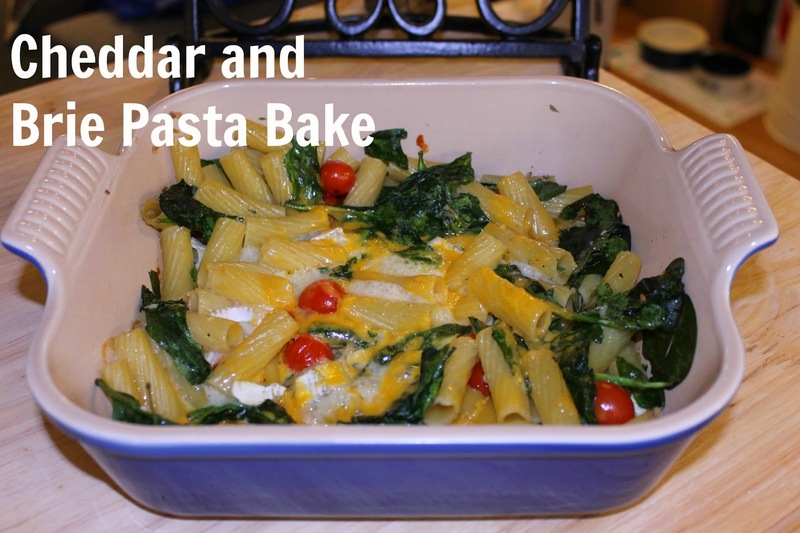 Recently, I've discovered pasta bakes as easy meals to make for dinner that reheat really nicely for lunch the next day. I've made this cherry tomato, spinach and garlic mozzarella bake a bunch of times and absolutely love it. It's cheesy, garlicky, and really filling. A few nights ago, I decided to make it but realized that I was out of mozzarella. Instead, I had brie. So, I made a few simple adjustments to the recipe, and it turned out delicious! 3. While pasta is cooking, prep spinach, shred cheddar cheese and tear brie into small pieces. 4. When pasta is finished, strain and pour into casserole dish, add whole cherry tomatoes, and brie. 5. Add garlic to casserole dish, drizzle with olive oil, add a few pinches salt and pepper. 6. Mix everything together and pour cheddar on top. 8. Serve immediately with a side of garlic bread, wine optional. To reheat, put into a microwave-safe container, lift the lid slightly and microwave for 90 seconds. Oh my word. You had me when I saw cheese. The rest of it looks phenomenal! I need to make this ASAP! Give me all the brie......it's my favorite!! !